Don't let pain and discomfort control your life. Let Us Help You! Get started on your path to health and healing with Advanced Integrative Rehabilitation & Pain Center. Contact us today to schedule your appointment! We are a health care practice in Washington, DC and McLean, Virginia promoting integrative medicine strategies to improve health. We have been leaders in medically diverse care for nearly three decades. In doing this we have been ahead of the curve and, sometimes, the odd-doctor-out, something we don’t mind. Our offices have been designed to enhance the healing experience for all of our patients. When treating patients, Dr. Sniezek employs a structured, time-proven process by which we work with you and your primary physicians to develop a coordinated, multidisciplinary treatment plan. We encourage all prospective clients to contact us with any questions about Integrative Medicine! We are happy to provide any education you seek. Experience a unique blend of conventional and complementary treatment methods that safely and effectively combine traditional medicine with acupuncture, chiropractic care, exercise, and nutrition. Unlike some practices with many providers sharing one office, Dr. Sniezek is an integrative health provider trained in multiple disciplines. This very powerful combination of knowledge, skill, and experience can save you valuable time. 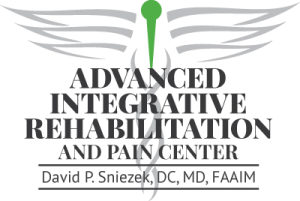 Whether you need integrative rehabilitation, chiropractic care, pain management, or any other integrative medicine approaches, our centers in Washington, DC and in McLean, VA are here to assist you. An integrative medicine approach is beneficial for addressing many conditions, including neck and lower back pain, headaches, elbow and shoulder pain, knee pain, and foot and ankle pain. We utilize integrative medicine to help relieve stress, manage pain, and improve overall well-being and health. Contact Advanced Integrative today to make an appointment with us!